The Everoze Wind Index shows that your GB onshore wind project should have been very close to average long-term P50 energy production assumptions in 2017, with the GB fleet performing overall 2-3% above average. The GB region north of Wales saw above average wind speed overall, with an especially strong April which brought annual averages up for this region. Further south, the mild and sunny April impacted wind speeds significantly, and contributed towards the slightly below average result for this half of GB. A poor January was not an ideal start to the year after a below average 2016, but the summer period was particularly windy for GB, and even with a disappointing December, Q4 was strong for most regions, delivering an overall wind speed index which was 1.4% up on long-term expectations. In terms of energy production, 1.4% above average wind speeds would have typically translated into a 2-3% improvement on energy production, assuming asset performance was on par. But the other big revenue driver for many plant is of course wholesale power prices. Here we saw the year start off well with day-ahead prices in the range of £45‑55 /MWh during January (not fully capitalised by poor January winds), reducing to £35‑£45 /MWh during March and remaining generally stable in this range through to July, except for a slight dip in June. Prices rose significantly from August through to December ending the year in the range £50‑60 /MWh. So 2017 overall was a decent year for the wind industry. How was it for you!? Please post your comments, thoughts and questions here. Note 1: Based on monthly mean wind speeds derived from reliable long-term data. 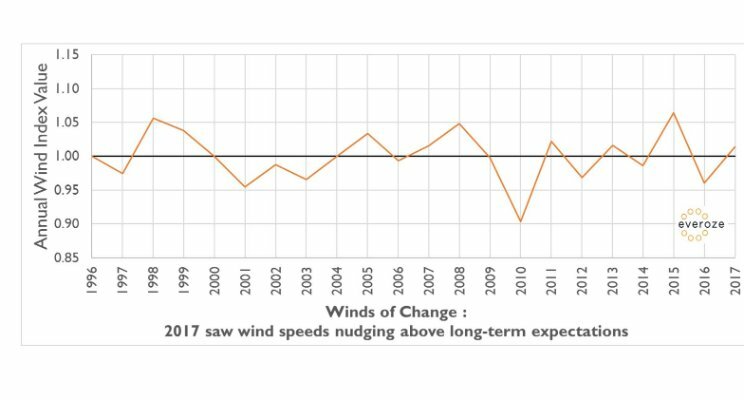 The index is normalised to a value of 1.0 based on wind speeds from January 1996 to December 2017. The individual monthly values are a measure of the relative windiness of that month compared with the overall long-term mean. The index represents onshore wind only in Great Britain (GB).